The Reds will meet Real Madrid in the final later this month. Liverpool's Georginio Wijnaldum celebrates scoring his side's second goal of the game. 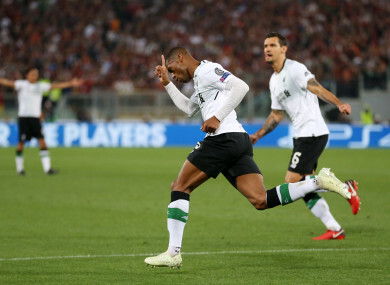 LIVERPOOL HELD OFF a spirited Roma fightback to reach the Champions League final 7-6 on aggregate despite losing 4-2 in a hectic semi-final second leg in Rome. Jurgen Klopp’s reached their eighth European Cup final and first since 2007 where they will play two-time holders Real Madrid in Kiev on May 26. First-half goals from Sadio Mane and Georginio Wijnaldum put Liverpool in control as Roma conceded their first goals in the Stadio Olimpico during the European campaign. But despite Radja Nainggolan bagging two goals for Roma in the final eight minutes — the second from the penalty spot — there was to be no second miracle comeback for the Italians after last month’s 3-0 win over Barcelona in Rome. It was another bitter defeat for Roma who lost the 1984 European Cup final to Liverpool on penalties. Roma threatened early with Alessandro Florenzi sending the ball wide in the opening minutes but the hosts paid for woeful defending, giving Klopp’s side space to gain an early advantage. Senegalese forward Mane got Liverpool off to a dream start after just nine minutes to the horror of the home fans. A Nainggolan howler in midfield gave Roberto Firmino the opportunity to barge through, delivering the ball to an unmarked Mane who left Roma ‘keeper Alisson with no chance. But six minutes later Roma got the equaliser when Liverpool defender Dejan Lovren’s attempt to clear a Stephan El Shaarawy header towards Dzeko across goal bounced off James Milner’s head, flying past Loris Karius and into the Liverpool goal. Liverpool’s ticket to the final in Kiev looked well and truly booked after 25 minutes when Wijnaldum nodded in. Alisson denied Mane but from the resulting corner Dzeko’s attempt to clear fell to waiting Dutchman Wijnaldum. Stephan El Shaarawy rattled the post on 35 minutes with Florenzi also firing wide, and Pellegrini showed how not to take a free-kick which was way off the mark. Dzeko broke through seven minutes into the second half with the equaliser after Karius cleared the ball straight into the path of the Bosnian who made no mistake for his eighth goal in 12 European matches. And in a desperate scramble by the Italians in front of goal four minutes from time Nainggolan made up for his earlier blunders when he drilled a low shot into the bottom-right corner from a distance for his first ever European goal. The Belgian midfielder added a second three minutes into injury time from a penalty awarded for a bitterly contested handball by substitute Ragnar Klavan, firing into the roof of the net. It was a dramatic finale for Eusebio di Francesco’s side but it was too little too late as they failed to reach their first final since 1984 but earned a standing ovation from the 62,000 crowd. Liverpool will again leave Rome victorious after winning the European title twice, in 1977 and 1984, at the Stadio Olimpico. Email “Nervy Liverpool prevail after highest scoring Champions League semi-final in history”. Feedback on “Nervy Liverpool prevail after highest scoring Champions League semi-final in history”.